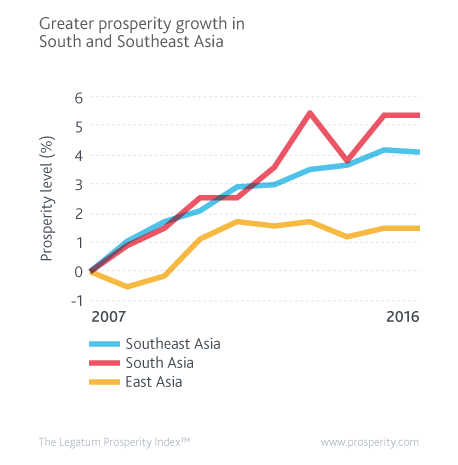 Four of the five countries with the largest prosperity gains in absolute terms between 2007 and 2016— Cambodia, Sri Lanka, Indonesia, and Nepal—come from South and Southeast Asia. Two factors are at play. First, easing of ethnic tensions and victory over military insurgents have allowed resources previously used to maintain security to be channelled into economic and social programmes. Second, proximity to fast-growing China has created numerous opportunities. China’s enormous appetite for primary commodities and consumer products has boosted export industries and facilitated local economies’ integration in the global production chain. Moreover, businesses squeezed out of China by rising costs can easily migrate south to benefit from the cheap, educated labour and business-friendly policies. 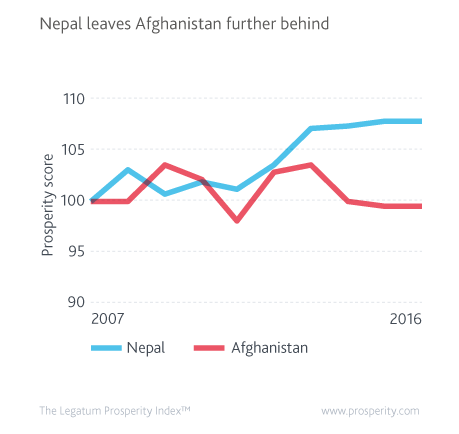 Enjoying similar levels of wealth per person, Nepal and Afghanistan have followed starkly contrasting paths over the past decade, emphasising the importance of safety and stability to prosperity-building in developing countries. In Nepal, the transition from monarchy to republic, after the peaceful resolution of the civil war, brought better governance and enhanced civil liberties. In contrast, recurrent conflicts in Afghanistan devastated the economy, aggravated ethnic divisions, and foiled international and domestic efforts to create effective and clean governance. The divergence between the two countries’ trajectories is clearly captured in the Prosperity Index: while Afghanistan continues to struggle at the bottom of the ranking table, Nepal has made a 15-rank jump since 2007, to become in 2016 the 94th most prosperous country globally – and this in spite of the devastating effects of the earthquake in 2015. 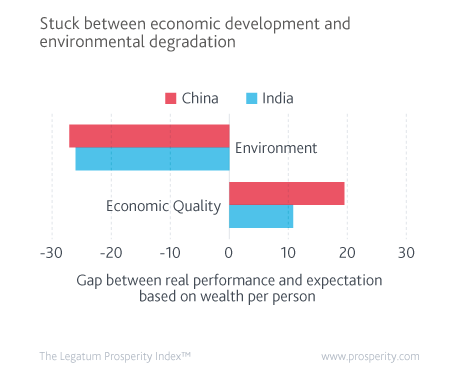 China and India’s unprecedented economic growth has lifted hundreds of millions out of poverty, substantially raised their people’s living standards, and its increasing beneficiaries have kept pressing policy-makers for deeper economic reforms. These achievements have come at a cost, however. Increasingly acute environmental deterioration in both countries exposes a darker side of their developmental stories. While both can boast a marked over-delivery in Economic Quality, their considerable deficits in Natural Environment – larger than any other Asian country’s, with the exception of conflict-torn Pakistan and Afghanistan – indicate a long journey before they achieve comprehensive prosperity. Moreover, both countries face challenges from unbalanced prosperity paradigms: while China’s long-term prosperity development may be constrained by its below-par Governance and Personal Freedom scores, democratic India struggles to improve its Education, Health, and Safety & Security performance. Social Capital crisis in East Asia? 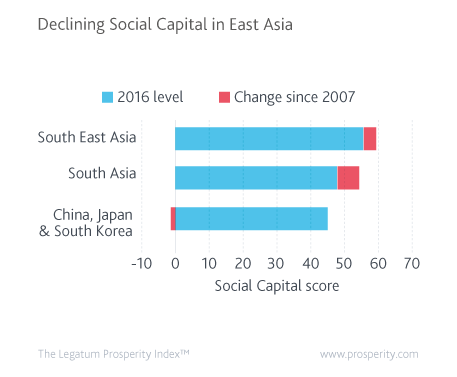 Already at a low level, Social Capital in China, Japan, and South Korea took a further hit over the past decade, while countries in other parts of Asia saw theirs steadily accumulating. People in these countries have historically been reserved in expressing opinions, which may explain some of the deficit. A more convincing explanation, however, highlights globalisation’s impact on traditional family - and community - based social structures. This is reflected in a decline in the help extended within and between families, and in the alienating effects of rapid urbanisation, demonstrated by a widespread mistrust of strangers in China. 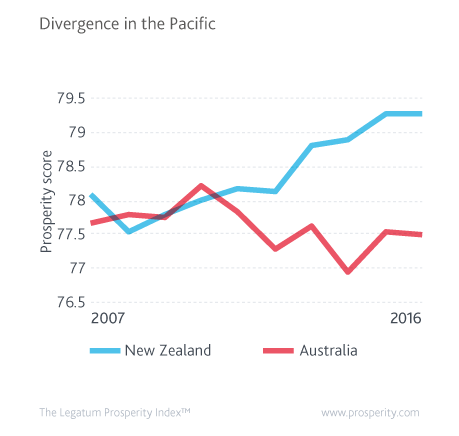 Australia and New Zealand long enjoyed similar levels of prosperity, but in the past six years have markedly diverged. The cause of this divergence has predominantly been structural. While in many ways New Zealand has been improving structural competitiveness, Australia’s has been declining. Be it labour market flexibility, government transparency, regulation, judicial independence, or effectiveness of government, the two countries have been moving in opposite directions. For example, on hiring and firing flexibility, Australia has fallen from 71st in the world into the bottom ten, while New Zealand has risen from 107th to 58th.